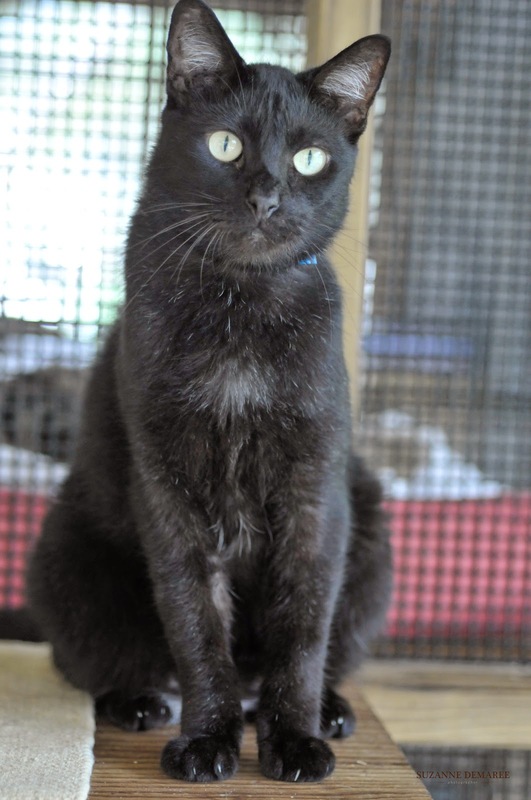 Pet Adoption | Humane Society of R-F: Midnight Looking for a New Best Friend! My name is Midnight and if I look a little sad, it's because I just lost my best girlfriend, Toona. We lived at the Humane Society for quite a while and were the official door greeters in Cattery One. A few days ago, a woman came in and we both ran to greet her. She was looking for a cat, but could only take one, and Toona was the lucky kitty. Now I have to greet visitors by myself. I'm an exceedingly friendly, handsome all-black guy. I'm a few years old but very active. I run all over the cattery and jump on the shelves so people can look in my eyes and pet me easily. (I love pets!) I like people and other cats. I don't have any experience with dogs but am willing to try. I'm very eager to please, will follow you everywhere and willingly walk into a carrier. Please come be my new friend. I'm neutered and ready to go home today.